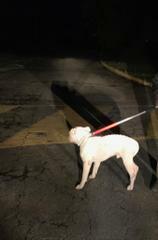 Dog in distress rescued by Altadena Deputies. Last night we had a call of a dog in distress who was locked behind the gate at a local school. Deputy Barber and McClendon went to the school and met Pasadena Humane Society. Unfortunately the keys to the gate weren't able to be located and it was decided to cut the chain to one of the gates to get inside and rescue the dog. The person who called the station was very happy we helped the dog and concerned very with the dog’s safety. The dog seemed to be happy as well, as he did not put up a fight. The dog would have been locked in a long 3-day very cold cold weekend. 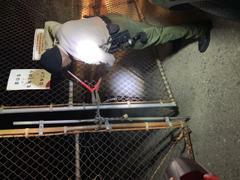 Deputy Barber and McClendon replaced the chain and bought a new lock to secure the gate. Just a few things we do to try and make lift a little easier for those in need for both 2 and 4 legged friends. It is unknown if the dogs human has been located. *update* The dog is at the Pasadena Humane Society and could be up for adoption on January 29th.